practice giving bad news to a patient. Kron first realized how little value is placed on doctor-patient interactions when he was a medical student in the late 1970s. An incomplete patient history or simply a lack of personal connection can lead to an unsatisfactory doctor-patient relationship, or worse. Poor communication is consistently a top contributor to the medical errors that result in about 400,000 deaths and up to eight million cases of “preventable harm” per year, according to a 2016 study by Johns Hopkins researchers, published in the British Medical Journal. For many years, major foundations and national certifying bodies have pushed for better communication training for doctors. Although training requirements are now in place, the methods currently used have not been successful. “The challenge is to develop a novel method that provides learners with the ‘why’ of learning — as in, why do I have to know this stuff? — and that will actually change people’s behaviors in practice,” Kron says. Robin is one of the three virtual human characters created by Kron and his writing partner, D.C. Fontana, perhaps best known as the author of a dozen scripts for the original “Star Trek” series and for “Star Trek: the Next Generation.” The Robin scenario lets users work on breaking bad news. The other two characters are Delmy (Robin’s mother), from El Salvador, whose old-world values illustrate the need for cultural sensitivity; and Nicole, an oncology nurse, whose discovery of an intern’s blunder provides training in resolving interpersonal conflicts. “We’re trying to give students the ability to gain experience in safe, virtual environments, with ‘conversational agents’ that look like people and with the ability to interact using the same range of verbal and nonverbal behaviors you would expect in conversation with another human,” Kron says. MPathic-VR, a product of Kron’s company Medical Cyberworlds Inc., is a real-time, “bidirectional” system where the computer is able to determine the user’s cognitive strategy and read facial expressions and body language. 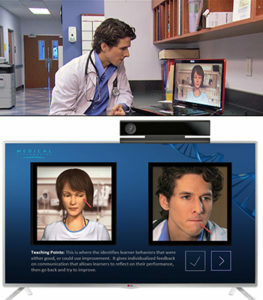 The on-screen characters react in real time, according to the doctor’s behavior in various situations. The program interprets the doctor’s performance based on “grading” criteria on many user inputs. 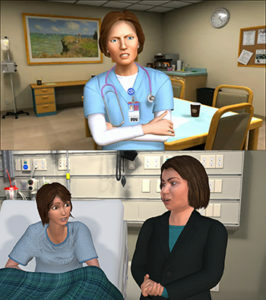 Robin and her fellow MPathic-VR characters underscore the importance of learning to talk with and understand different types of people through realistic interactions, reflection and deliberate practice, a departure from traditional medical school communication training via lectures and workshops and “standardized patients,” people who have been trained to portray certain types of patient roles. A doctor once told Kron that he learned more about working with patients and colleagues by watching the TV comedy “Scrubs” than he did in all four years of medical school. Kron wasn’t surprised: The “Scrubs” narrative allows viewers to engage with the characters and care about them. That’s why he and Fontana created a story arc for their training system, writing and evaluating it as if they were developing a television program — only instead of episodes, they created a series of richly drawn characters and thematically linked modules, each designed to highlight a different learning competency. Medical Cyberworlds recently completed a trial with 421 second-year students at three medical schools. The students who went through the MPathic program were tested against a control group of students who had received traditional training. How does a physician in Madison, Wis., recruit a “Star Trek” writer to generate characters and stories for an interactive medical student training tool? It helps to be a part of the “Star Trek” universe. 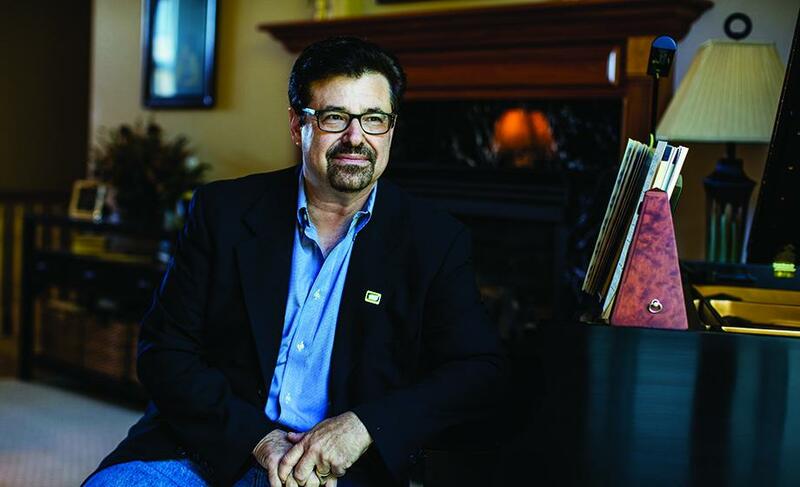 Since the late 1980s, Kron has been a television script writer with credits that range from “The Smurfs” to “Star Trek: The Next Generation,” which Fontana helped launch. While doing an Air Force residency in radiology, Kron began questioning whether he wanted to stay in medicine. A friend encouraged him to pursue something that he really wanted to do: write for television. Kron’s toddler daughter was a fan of the “The Smurfs.” During his free time, he drafted a “Smurfs” script and sent it to the story editor, who was amazed that “a doctor, Air Force major, radiology guy” would want to write for a Saturday morning cartoon — and that he was better than most of the writers working on the show. Kron began landing more assignments and eventually worked on three different shows while still a radiology resident. Offered a promotion to chief resident, he declined so that he could continue writing, while practicing general medicine in Orange County, Calif. Despite uncertainty about his future, Kron found it hard to let go of his medical career. Things turned around when his supervisor offered him the chance to attend a year-long course at University of California, Irvine on doctor-patient communication. While there, he was interviewed by a TV news reporter intrigued by his status as doctor-writer. That’s when he experienced his “a-ha” moment. Kron began considering the possibility of using simulation and game-based technology to shape situations that register as authentic with both students and accomplished physicians. By interacting in these situations learners would develop a “toolbox of skills” that they could use in practice. To engineer realistic “virtual humans” he consulted prominent psychologist Paul Ekman, a pioneer in the study of emotions and their relation to facial expressions. Ekman told Kron that when he served on the faculty at the University of California San Francisco Medical School, he was denied a chance to lecture to medical students. Finally, he was given one hour to lecture students on recognizing patients’ nonverbal behavior and facial expressions. “That’s one hour out of four years of medical school,” Kron stresses. Filming an MPathic-VR training scene featuring Robin, a leukemia patient, and her mother, Delmy. Ekman joined a core group of people to work with Kron — professionals from medicine, entertainment, high-tech psychology and simulation. Interestingly, each had tales to share about medical interactions gone wrong. Like the one about a doctor who wouldn’t prescribe palliative care for a dying friend because it would be a waste of time. Or the surgeon who blithely dismissed a patient’s anxiety about a procedure. Or the patient who woke from exploratory surgery to be brusquely told by his doctor that one of his testicles had been cancerous and was removed. The doctor then walked away without a word of explanation or comfort for his stunned patient. Kron is now considering marketing the MPathic-VR system for use in fields other than medicine. His own experience, Kron says, is just one example of how Clark students learn to develop creative, innovative ways of solving problems. And that’s not only because of the University’s excellent professors, he adds — it’s the “Clark milieu” that challenges students to use knowledge in the pursuit of self-actualization and altruistic goals. Those who have used the MPathic-VR program report that its dramatic situations give them a low-stakes way to practice handling high-stakes conversations, Kron says. The beginning, middle and end are written, but Kron isn’t revealing any spoilers about Robin’s fate. He will say that no matter how many times she expresses fear or anger, or threatens to walk out, there will be an opportunity for the doctor to help Robin understand she has an ally. Done right, the message is as simple as two words: I care.